Soglar’s Standardised Full Potency (SFP) Herbs are developed through a unique process that integrates the ideologies of both traditional herbalism and standardised herbal technology. To ensure consistent and reliable phytonutrient levels, we guarantee a consistent amount of these important active plant compounds. Then, we blend these enhanced, “standardised” compounds with all the components that occur naturally in the whole herb. The result is a potent, premium-quality standardised herbal extract with all the synergistic and beneficial qualities found in nature. A "standardized herbal extract" is a measurable marker substance that is extracted from the herb. This marker may be an active ingredient, or just one that is easily determined, but often, it is a compound that has been used in scientific research. In standardized extracts "active compounds are natural compounds found in an herb that is proven to be responsible for its healthy benefits. 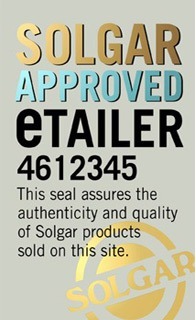 Solgar supplies several different Standardised herbs supplement products such as Solgar Acai (Brazilian berry) Extract 60 Softgels Capsules, Solgar Ashwagandha (Withania somnifera) Root Extract 60 Vegicaps Capsules and Solgar Astragalus Root (Astragalus membranaceus) Extract 60 Vegicaps Capsules.